What are you afraid of, Merry Christmas people? Are you afraid that if you are nice to someone of another religion, you might find out she is a person too and deserves the same respect for her beliefs that you expect—demand—for yours? It’s that time of year again, when the Christians come out of the woodwork online and in person to declare that there’s a War on Christmas. 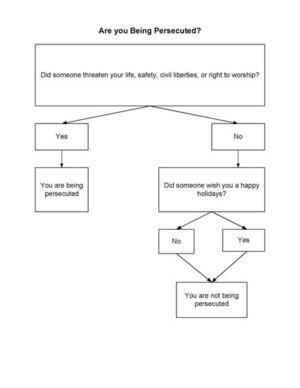 Everyone is posting picture statuses on social media about how offensive the greeting of “Happy Holidays” is. And if someone like me, who hasn’t got a good filter between her brain and her mouth, decides to point out that “Merry Christmas” is actually pretty rude, well I’m in the vanguard in the War against Christmas. These anti- Happy Holidays people will actually call for boycotts on stores who have instructed their employees to say Happy Holidays to customers! A store that acknowledges that other religions and holidays exist? Mustn’t shop there, those other religions are like a disease, what if you catch one and wake up atheist one morning? Saying Happy Holidays to a Merry Christmas nut is so incredibly offensive to them. They can't comprehend that no one is dissing Jesus by saying Happy Holidays. On the flip side, they almost seem to gloat over how their Merry Christmas insistence might be offensive to other people; those other people don't worship Jesus so clearly they deserve it to be offended, because they themselves are offensive for not being good Christians. If I expect the Happy Holidays deniers to say Merry Yule to me, or Happy Kwanza, or Happy Chanukah, or Happy Festivus, they won’t do it, because they don’t believe in those religions. (They might, reluctantly, throw out a Happy Chanukah, because after all Jewish people read the Bible. But then again, they killed Jesus, didn't they?) Yet they expect people who don’t worship Jesus to ONLY use their greeting and don’t care how disrespectful that is toward the other person’s religious beliefs (or lack thereof, for my atheist friends). Merry Christmas says, “You better love Jesus and if you don’t you are going to hell because your beliefs are wrong and your holiday is wrong.” Merry Christmas is EXCLUSIVE; it excludes everyone with different beliefs. It is not friendly. It is not loving. It is fearful. What are you afraid of, Merry Christmas people? Are you afraid that if you are nice to someone of another religion, you might find out she is a person too and deserves the same respect for her beliefs that you expect—demand—for yours? Image sources: Facebook, everywhere online, and I made the green and red one a few years ago.